If you understand these three rules, much of the confusion surrounding spousal benefits is easy to clear up. To be eligible for a spousal benefit, your spouse must have filed for their own benefits. An ex-spouse is exempt from that rule. To claim a spousal benefit based on an ex-spouse's earnings record, your ex-spouse has to be 62 and eligible for benefits, but there is no requirement that they must have already filed for benefits. To claim a spousal benefit based on your current spouse's earnings record, your current spouse must have filed for their own benefits already and you must have been married for at least 9 months or the death was accidental or happened in the line of military duty. There used to be a strategy for married couples called "file and suspend" where one spouse would file but immediately suspend their benefits, which allowed the other spouse to file for spousal benefits. However, this strategy is no longer available. Due to new Social Security laws that were passed in November 2015 anyone who suspends benefits after April 30, 2016, will end up suspending all benefits based on their record — which means a spouse cannot collect spousal benefits during a time when their spouse has "suspended" benefits. Bottom line: If you are still married, your spouse must file on their own first to make you eligible for a spousal benefit. If you have an ex-spouse, you were married over 10 years, have been divorced for 2 years, not remarried, and your ex is 62 and eligible for their own benefits, your spouse is not required to file for you to be eligible for a spousal benefit. When you file for your Social Security retirement benefits you are deemed to be filing for both your own benefit and a spousal benefit, and you will be given the higher of the two. If you were born on or before Jan. 1, 1954, and you are full retirement age (FRA) or older, you can specify on your application that it is a restricted application and then you can choose to claim either your own benefit or a spousal benefit. You are at FRA (Full retirement age) or older. You were born on or before Jan. 1, 1954 (this rule went into effect Nov. 2, 2015). Prior to reaching your FRA, you cannot use a restricted application to designate that you wish to file only for a spousal benefit. If you were born on or before Jan. 1, 1954, once you reach your FRA you can use a restricted application to restrict the scope of your application to spousal benefits only, allowing you to later switch to your own benefit amount. If you were born on or after Jan. 2, 1954, when you file for benefits you will be deemed to be filing for all benefits you are eligible for. If your spouse has already filed, you will automatically receive the larger of your own or the spousal benefit. If your spouse has not filed yet but you have, when your spouse files, the deemed filing rules come into play. At that time you will be eligible for a spousal benefit, and if it is more than what you are currently getting, Social Security will automatically pay you the extra amount each month. The confusion comes in when you have a younger spouse (let's say 62) who has filed, and an older spouse (let's say 65) who has not filed yet. Suppose the younger spouse files at 62. As the older spouse has not filed yet, spousal benefits are not available yet so the younger spouse gets his/her own benefit amount. When the older spouse files for benefits the younger spouse will become eligible for a spousal benefit, but because the younger spouse filed early (before they reached their FRA) the benefit calculation to determine the amount of spousal benefit is a little different. I've heard it called both an "excess spousal" benefit and a "supplemental spousal" benefit. Normally a spousal benefit is 50% of the spouse's FRA benefit amount, reduced if the spouse claiming the spousal benefit is filing for benefits early. If one spouse is already receiving their own benefits, and later becomes eligible for a spousal benefit, there is a formula that is used to determine what amount of spousal benefit (if any) they may receive. Let's work through it by expanding upon our example above. The younger spouse claimed at 62. Her primary insurance amount (PIA) was $800, but because she claimed early she received $600 per month in benefits. ($800/.75 represents the reduction she receives for claiming before her FRA.) The older spouse will claim when he turns 66. His primary insurance amount (PIA) is $2,100. Take the older spouse's PIA divided by 2, minus the younger spouse's PIA. $2,100/2 = $1,050 - $800 = $250. When her husband files for benefits and she becomes eligible for a spousal benefit, that $250 gets added to what she is currently receiving so her monthly benefit will go from $600 to $850 at that time. If she had waited until her own FRA to file benefits, she would have received the full spousal benefit of $1,050, as that would have been higher than her own FRA benefit amount of $800. Of course, she would have had to forgo the first four years of benefits to receive the higher amount. In this particular case, it likely made sense for her to file early. 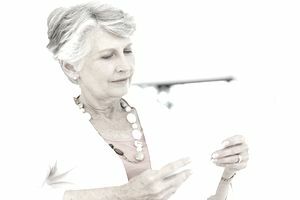 Benefits for Spouses—This page also has a calculator that computes the effect of early retirement. Benefits Estimator—This page takes you to Social Security's calculators that allow you to get as detailed as you would like to estimate your benefits. Retirement Planner: Benefits for You As a Spouse—A simplified version of the rules regarding spousal benefits.